There’s nothing better than waking up at leisure, and strolling down to breakfast without having to leave the building. Our second day exploring Prince Edward County started in the perfect way – with lemon blueberry waffles shaped like farm stuff!! 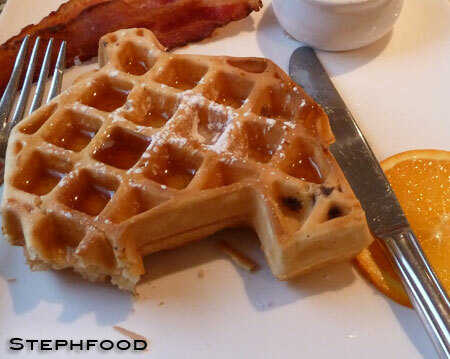 My waffle was shaped like a barn, while J had a rooster and a cow. They were so adorable I almost didn’t want to eat them. It’s probably a good thing I ended up with the barn. 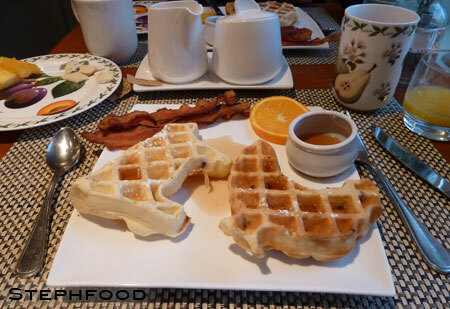 Considering my lack of adorable photos of Merrill Inn, these waffles will have to illustrate this part of my story. It’s pretty fitting, actually, because Merill Inn was perfectly adorable but with the comfort of the bigger hotels. 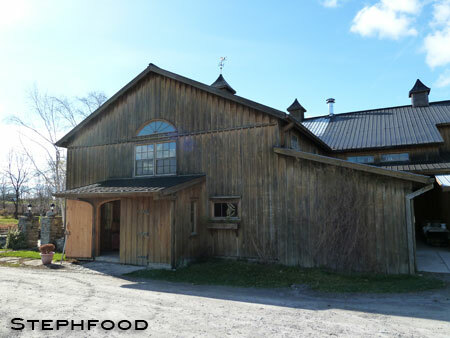 It was really the perfect place to stay for us, and it was right in the heart of Picton, which itself was the centre point of everything we wanted to see in Prince Edward County. Our package even included a bagged picnic lunch, which we brought on the road with us. 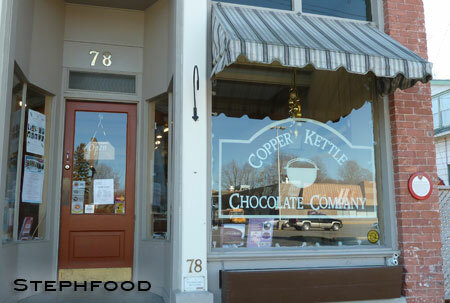 Once we got rolling, we started headed right to Copper Kettle Chocolate Company. We had our first taste of things to come the night before, when we practically inhaled the goat cheese truffles that I bought at Fifth Town. 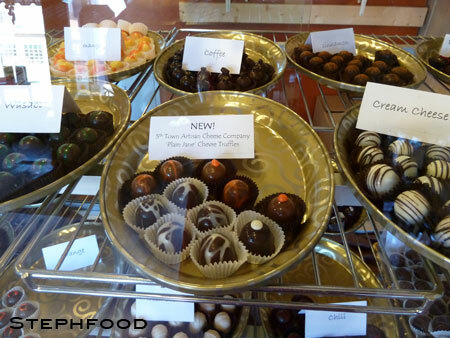 To back it up a little, this is just one example of the county working together – the goat cheese was made by Fifth Town and the chocolate was done by Copper Kettle. Both companies carry and advertise the product, and both companies get business. Symbiosis! Of course, we got more of them, along with a number of other fun truffles. They also had some chocolate ‘shots’ full of different wines and things, so we got a couple ice wine shots and a couple of Pinot Noir. Down the Loyalist Parkway we went, to another bunch of wineries and fun. At Huff Estates, we bought a really interesting unoaked Merlot, which was pretty novel for me. Next, we ended up at Sugarbush Vineyards, which is a self-proclaimed ‘garagiste‘ winery. There, aside from buying some wine, we enjoyed a chat with the owner about the area’s history. 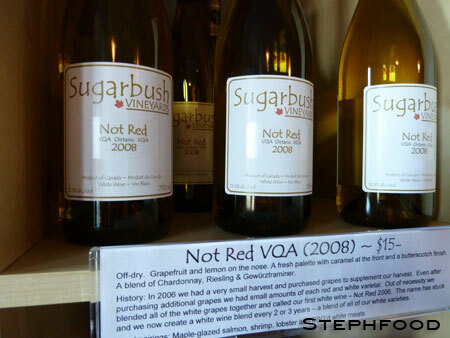 Sugarbush Vineyards ‘Not Red’ wine — oddly, we didn’t buy this particular wine. I just thought the name was funny. Another part of our package at Merrill Inn was a complimentary wine tasting at Closson Chase, a winery that focuses on producing Chardonnay. We aren’t big white wine drinkers, and to be totally honest, the price points were a little higher than we were looking for here. Nonetheless, we took the opportunity to try some wines we wouldn’t have thought to try. 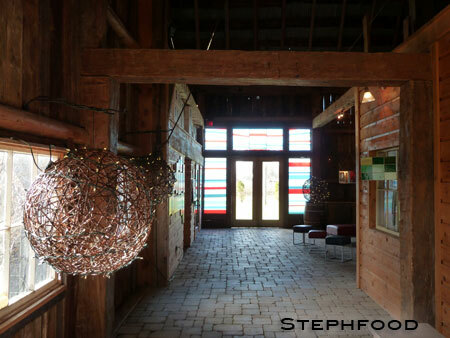 The Closson Chase tasting room was inside a large and lovely barn, with stained glass, local art and lots of ambiance. Similarly, The Grange of Prince Edward is also situated in an incredible barn, overlooking a fantastic lot where it seems people book picnics in the summer. Yeah, I think we’ll be going back to do that sometime. We politely asked if we could enjoy our packed lunches in their tasting room, overlooking the farm, since it was too windy and cold to eat outside. We hit a few more wineries before we called it a day, including Lacey, Casa Dea and Sandbanks. By this time, I was slowing down and started playing this game where I was only allowed to pick one wine to try, and only try another if I wasn’t convinced by the first one. This was a change from the start of the day, where we tried 3-4 different wines at each location. At Sandbanks, for example, I saw that they had a Foch Reserve and chose to try that because we hadn’t seen Marechal Foch at the other wineries we had been to, and I like to have a variety. We got to try pairing it with both cheese and chocolate and in the end, ended up buying a bottle. The prices there were very reasonable, too, so I think we’ll go back again. 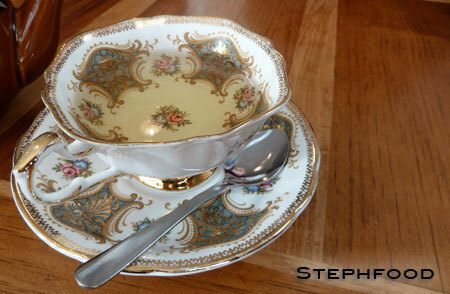 I just couldn’t do any more that day – so we stopped at Tall Poppy Café in Wellington for some “Not Wine”. From there, we headed back to the hotel for a nap before dinner. I was really looking forward to this dinner, conveniently at the restaurant at the Merrill Inn, having read many glowing reviews of the food there. They didn’t disappoint – but I did, with my photo taking. My sad photo of the gnocchi appetizer looks oddly pink. Boo! It tasted like clouds of lemony heaven. The meal was as incredible as I had hoped. 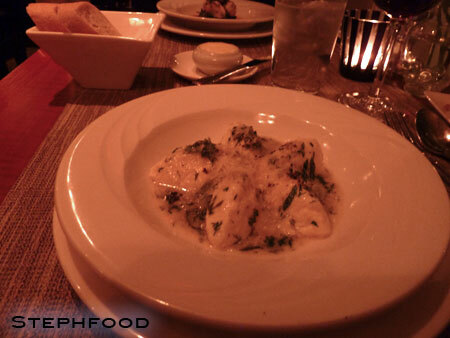 I started with a soft lemony gnocchi appetizer that melted in my mouth. The main course was a rack of lamb – a new adventure for me – with tabbouleh. For dessert, I had “Baked Alaska” for the first time. Unlike my usual choice of “something dark chocolatey”, I enjoyed the mix of meringue and gelato and cake. Yummy! 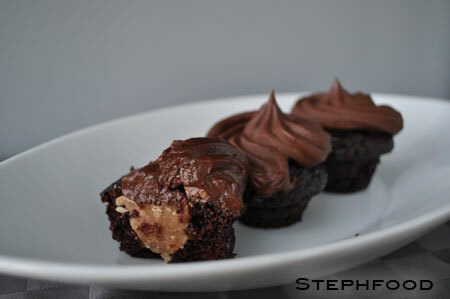 Surviving a Salted Caramel Cupcake Fail! I just have to deal with the fact that I am not a great baker. I’ll still try to do it, but wow I need to have a little more patience with myself. Since I bought the Martha Stewart Cupcakes book earlier this year, I’ve been wanting to make the Salted Caramel chocolate cupcakes. 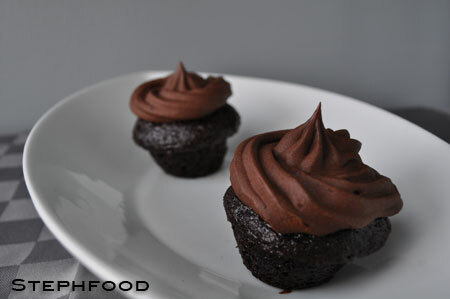 They looked like everything I like about food – sweet, rich, salty and chocolatey. I finally decided to make them to bring to Hallowe’en movie night. I managed to mess something up at each stage. The cupcakes stuck to the baking tin, and lost some chunks when I pulled them out. I didn’t have mini cupcake liners, but it wasn’t a problem last time. I just oiled it up and went ahead. Needless to say, I was not happy. Some of them wouldn’t stand on their own because of their injuries. On the other hand, they were really tasty and I decided it wasn’t too big of an issue. I messed this up twice, basically. The caramel sauce ended up being the worst part of the whole thing – everything else sort of pulled together, except for this part. Instead of sauce inside, it’s like a piece of caramelly fudge, or like the texture of candy corn. Grrr. My problem revolved around my lack of a candy thermometer, and I couldn’t judge when it was cooked enough. I knew we had a thermometer and pulled it out – only to discover that it’s a meat thermometer and doesn’t measure a high enough temperature. Crap on a stick! If you don’t have a candy thermometer, it helps to know the different stages to look for. I found this web page that describes the different stages, but I still messed it up. First, I pulled it off the heat too early because I thought it was cooked more than it was. I added the cream, and realized it was too light and oogy. I put it back on the heat, cooked until it browned and tasted better — but then after I poured the sauce into the cupcakes, it started to harden funny (the aforementioned candy corn texture). Ah well, not much to be done about that – and I was too lazy to start over by baking new cupcakes. Following the instructions, the dark chocolate icing ended up being the consistency of chocolate soup. I saved it by putting the bowl of icing ingredients into a larger bowl full of ice, and beating the crap out of it as it cooled. It turned out really really good. As a side note — I have no scale and had no idea what one pound of chocolate should look like. I guesstimated, and it worked. I don’t think my baking warrants getting a scale, either. Oh yeah – and I forgot to add the decorative salt on top before I took pics. Hahaha! While I screwed all sorts of things up, these turned out pretty tasty. I do eventually want to try the recipe again, to try to get it all perfect. First, I’ll tackle the caramel a couple more times and use it in other things. 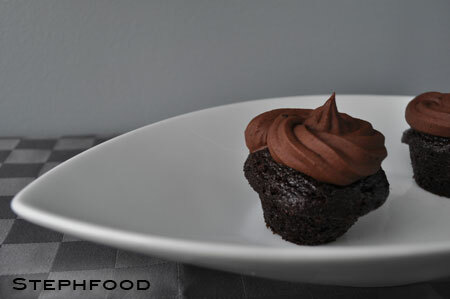 The chocolate frosting on this is really incredible – and it should be, considering the amount of butter that’s in it!! They don’t have this recipe up on the Martha Stewart website, but I found it posted on this blog. 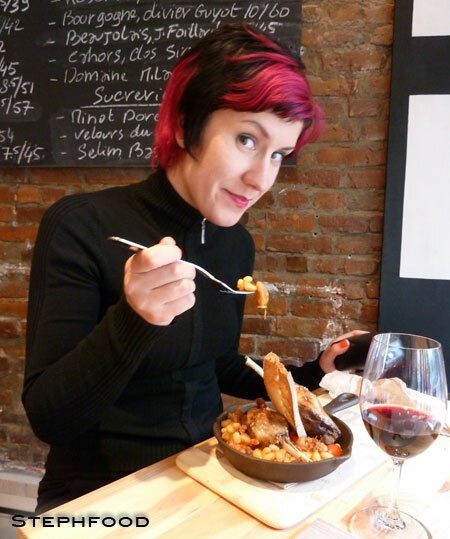 Note that this blogger had no trouble with the caramel… so it’s obviously me. UPDATE: I bought a candy thermometer. I am determined to make this work, because I really love caramel and I think I should be able to make it. In this installment of ‘Market Mayhem’, I visit the home of chocolate lovers to enjoy the ‘elixir of the Gods’. 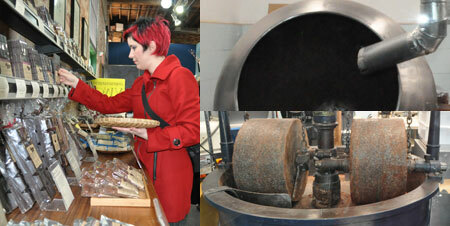 Yes, my friends, I went to Soma Chocolatemaker, my very favourite chocolate shop in Toronto. While there, I enjoyed some some Mayan hot chocolate, some truffles (Douglas Fir, Olive Oil and Balsamic Vinegar) and went home with a parting gift, to be enjoyed later. Perusing chocolate, watching the machines in the Chocolate Lab (tee-hee). Beware of the spooky faces I make in the video. Not sure what’s going on here, but I get all squinty and weird when in front of a camera. I need to practise in front of a mirror or something. No, I didn’t buy the $75 chocolate bar… but I didn’t buy the smallest one, either. Yes, we did end up buying a Douglas Fir truffle, and yes it does kinda taste like trees… but in a good way. I know that trees, olive oil, hot chilis and balsamic vinegar all sound like bizarre ingredients for chocolate, but they are amazing and should be tried at least once. 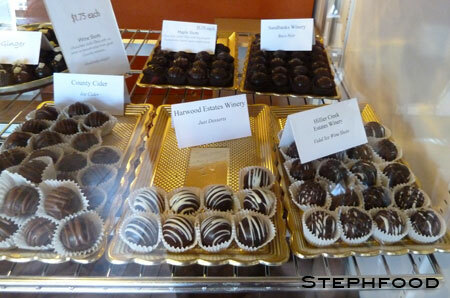 These are the ones I reach for the most – when I’m spending that much on a truffle, I don’t want to play it safe. Go! Find your local chocolate maker! Indulge!